The woodcarving of Myanmar is justly famous. Few woodcarvers in the world can match the technical skills of Burmese artisans in creating designs of great spontaneity, freedom and intricacy. These designs may first be drawn on paper, especially ones of great detail. The general outline is cut first with saw, chisel and axe; then an expert with years of experience (a master woodcarver) does the carving. Myanmar's great forests must have provided a wealth of material for woodcarvers in the first millennium and before. While no carvings remain from that period, those on the wooden lintels above the main entrance to the hall and the entrance to the shrine of the late 11th century Nagayon, Bagan, give evidence in their sophistication that they are the product of a long lineage of woodcarving. Small images of what may be vidhyadhara (celestial begins who have attained wisdom and magical powers and can fly through the air) are depicted as fast-moving figures within roundels inside lozenges and within ellipsoids, the interiors and exteriors of which are ornamented with delicately carved flowers and what may be clouds. Also of the same period was a wooden door found at the Shwezigon pagoda, still extant at the turn of the century, with carved panels of scrollwork, flowers, musicians and dancers all seated within beaded borders. These were reserved for monasteries, palaces, royal barges and carriages. Temple murals in the 12th century Lokahteikpan and the circa 13th century Chaukpayahlange, plus a red ochre sketch in the Hpayathonzu, also of 13th century Bagan, all depict pyat-that hsaung (buildings with a tiered roof) with imposing makara pediments on each side and a many-tiered roof. The Chaukpayahlange shows that the roof tiers and the finial were heavily carved and were gilded. By the early part of the 17th century, as witnessed by the designs of doorways at the Hpowindaung Caves, a great change had taken place in the relief decorating doorways and windows. The pediments were no longer outlined by the bodies of two makaras as in classical Bagan, but were decorated at the sides with saing-baung, ornamented elements in the form of haunches of a wild ox. Wooden door panels with door guardians in relief attest to the virtuosity of the local carvers. The murals of these caves depict great palaces adorned with carved pyat-that and pediments plus royal carriages each with a carved pyat-that. The 18th century murals of Bangan indicate the continuation of architectural and woodcarving styles. In the late 18th and early part of the 19th century, the capital seesawed between Ava and Amarapura. When King Mindon changed the capital site from Amarapura to Mandalay in 1857, he dismantled the wooden palace buildings and restructured them at Mandalay. Thus the remarkable carvings remaining from the palace now seen at the Shwenandaw monastery in Mandalay may date to a pre-Mandalay period. 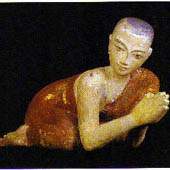 Jatakas, stories of the lives of Gotama Buddha prior to his birth as Prince Siddhattha, appear to have been known in Myanmar at least in the 5th century. This is evidenced by a large terracotta plaque in high relief from the Khin-ba mound, Thayekhittaya, identified as depicting an episode in the Mugapakkha (Temiya) Jataka (No 538). The last ten Jatakas depicting the last ten lives of the Buddha are a favorite subject of woodcarvers, ceramists and painters alike. In fact, they have been the most popular stories depicted in Burmese art since at least the 11th century. The Mon in southern Myanmar initially followed a recession of 550, Jataka stories. In the late 11th century, King Kyanzittha of Bagan adopted the Singhalese recession of 547, which has remained the standard one. Although Jataka Plaques surely must have been cared of wood during the classical Bangan period and before, the earliest extant wooden ones date to the Konbaung Dynasty (1752-1885). The Jataka carvings at the Yoe Soe monastery in Sa-le reflect a growing interest in portraying the lives of the ordinary people as found in murals of the Jatakas in 18th and early 19th century Bagan, and in Western realism introduced later in the 19th century. Figures that play an important role in Buddhism such as the Buddha's disciples, novices and the lokanat (possibly a form of the bodhisattva Avalokiteshvara) are often found in monasteries and nunneries. Carvings of these figures may adorn the walls of religious sites and palaces or may be freestanding, and are accepted as a natural part of the life of the faithful. Other woodcarvings for devotional use include such examples as the earth goddess Wathundaye wringing the water from her hair, attesting to the Buddha's right to Enlightenment because of all the water he ritually poured when he performed good deeds in his previous lives; Shin Thiwali, a standing monk with bowl and fan who is the patron saint of travelers; Shin Upangok, a seated monk glancing upward with his right had in his alms bowl, propitiated for good weather; Thurathati (Svarasvati) goddess of learning and the guardian of the Buddhist scriptures, seen riding a hintha with a book in her had; and the tangu-daing, a tall flagstaff generally decorated with a hintha and a long streamer. Other subjects in which Myanmar woodcarvers' delight are the beings from Buddhist cosmology and the nats. According to this cosmology, at the four cardinal points of Mt Meru, the great mountain at the center of the universe, there are four continents. The southernmost is Jambu, on which is the Himavanta mountain range and forest. In the latter dwell the kinnara and kinnari, he half-man and she half-woman respectively, and both half-bird. 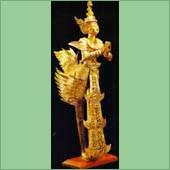 The kinnara is depicted in the symmetrical royal attire of the Mandalay period with the addition of a tall flanged crown. The wings and tail flutter delicately to his rear. The artist has created a sense of motion and beauty in what could have been a static figure. Respect for nats is an inherent part of Burmese culture, and carvings of nats are frequently seen. They may be nature spirits, ones from mythology, or humans who have died unnatural deaths. Included among the last are those who constitute a pantheon of 37 nats. Nats are specifically carved to be placed on pagoda platforms and other Buddhist edifices. As spirits, they require propitiation, and are also regarded, like humans, as disciples of the Buddha. During the 12th century the widespread adoption of Buddhism suppressed, but never replaced, the pre-Buddhist practice of nat (spirit) worship. Nat worship dates back to proto- and possibly prehistoric times; originally, it revolved around land, sky and water spirits, and was obviously linked to agricultural endeavours. But by the Bang era, historical personages started gaining spirit status, probably in response to increased cent5ralization of governing power (giving people martyrs to pay tribute to), and possibly influenced by similar cuts in India. Many nats are thought to be descended from people who had died violent, unjust deaths. These supra-human nats, when correctly propitiated, can aid worshippers in accomplishing important tasks, the most potent of the nats make up a well known pantheon of 37, all of whom make Mt Popa their main spiritual abode. Today this rock outcropping jutting from the plain near Bagan remains a major point of pilgrimage for many Burmese. A visit to a temple reveals any number of nats housed in shrines dotted around the temple compound in apparent contrast with the Buddhist nature of the place. And on sale in the pagoda alley markets are all the figures in the 37- nat pantheon-and more. These are purchased by the devout, and when placed in nat kaun (spirit home) shrines in the home, become the recipients of food, liquor, flowers and other consumables. Thus are the powerful spirits placated. Among the great artistic achievements of the people of Myanmar is yun, the generic name for lacquer in Myanmar. Durable and beautiful items are produced by a time-tested method, the vital element of which is the sap from the Melanorrhoea usitata tree. First the object to be lacquered is constructed from either bamboo or wood. 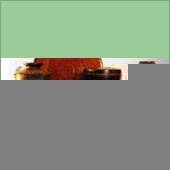 The lightest, most pliable lacquer wares are made of interwoven bamboo strips and horsehair. Other fine wares are made of woven and int4erlaced bamboo strips. Softwoods are used for screens, folding tables and rectangular boxes, and teak form heavier pieces. For bamboo, a dried bamboo trunk is cut into strips, which may be coiled, woven or twisted, as the shape of the object requires. When the basic form is completed, a coat of lacquer mixed with fine clay seals it. It is then put into a special cellar to dry for three to ten days. Afterwards, it is smoothed and polished with pumice on a simple hand lathe, where upon another and finer sealing layer is added and the object is put back into the cellar. 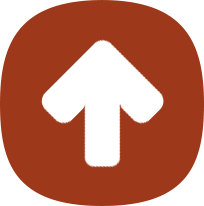 This process is repeated again and again until the item is completely smooth. Finally, it is given a coat of fine, glossy-quality lacquer. Several steps of sealing, polishing, drying and lacquering take place before an object is ready for final decoration. The lacquer, which comes from the sap of the wild Melanorrhoea tree, is naturally black. Different colors are produced with the addition of different elements: red by the addition of cinnabar, yellow by orpiment, blue by indigo, and green from a mixture of yellow and green. Blue was rarely used traditionally as a separate color. More precisely, the term yun is the name of a gloriously imaginative incised lacquer ware. Here, the artist can show his capacity to bring legends to life and introduce a plethora of lively motifs. The style originated in China, and how it came to Myamar and to be centered in Bagan is still debated. The technique demands skill and patience. An object already covered with a glossy coat of lacquer is incised sequentially with elements of an overall design to be presented in chosen colors. Supposing, for example, the background is black. The artist, working freehand, might first incise lines to be filled with red. The surface of the object is then entirely covered with the colorant, ensuring that the lines are also filled with red. It is then placed in a drying cellar for three or four days, after which the excess of red is removed by polishing on a lathe. The color is sealed in by a coating of resin. When this is dry, the engraving of the second color begins and the process continues through the next color(s). Since the Shan State is home to the trees from which the best lacquer is derived, some scholars consider that lacquer ware production came to Bagan via Laikha. This is still the predominant center of lacquer ware production in the southern part of the state. Lesser centers are at Ywama and Tha-lei on Inle Lake. The most important center in the north is Kengtung. Rare wares whose main surfaces are covered with green lacquer are a notable product of the Shan State. The green is produced from a mixture of orpiment and indigo, both of which are found in the region. The orpiment is ground into a powder, and to it are added ground indigo, translucent gum, lacquer and resin. Green lacquer may be decorated with yun, shwe-zawa or theyo designs. Red and black lacquer produced in the Shan State has a brilliant sheen. This may be due to the excellence of the lacquer in the region. These colors are often used in bold juxtaposition to create unusual designs. Many wares tend to be robust. Kengtung is noted for the delicacy of had-moulded gilded thayo work, particularly on rice baskets called kotaute, which have a black lacquer body, gilded thayo at the top, and panels below bearing figures of a couple from an ethnic group. These date to the period between the World Wars, and are now much coveted by collectors. Relief-moulded lacquer (thayo) receptacles created mostly in Mandalay for Buddhist votive use constitute an art form in which Myanmar excels. Lacquer is mixed with sifted paddy husk or cow dung ashes to which pulverized bone is added for strength, resultiong in a plastic material easily moulded, modelled or stamped into relief designs. Thayo will adhere to wood, basketry, stone and metal. When each formed piece of thayo has hardened, it is lacquered at the rear and appropriately placed. Thayo designs may be inset with glass. Early glass was backed with mercury-treated foil, but in the latter part of the 19th century, mirror glass replaced it. The most spectacular receptacles are the hsun-ok, tall pedestal-bowls used to offer food to monks. Their covers are surmounted by a pagoda-like finial at times inset with a hintha (Brahmani duck) or sphere. 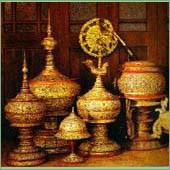 Monks' alms bowls (thabeik), covered and lavishly gilded and glass inlaid, are set on a kalat, a small tray with a stemmed base. Kun-daung, holders for betel leaves arranged in a spire as an offering, and betel box in the form of a hintha, are also popular votive object of thayo decoration. The earliest manuscript found in Myanmar was in the 5th century Khin Ba mound at Thayekhittaya. It is one inscribed with excerpts from the Vinaya and Abhidhamma (two of the three parts of the Pali Tipitika) on 20 gold leaves 16.5 cm in length and 4 cm in width. It had two gold covers bound together by a thick gold wire and its ends were fastened to the covers by sealing wax and small glass beads. Each leaf and comer had two holes through which the gold wire passed. This is stylistically related to two important manuscript types, palm-leaf manuscripts and kammavaca, both of which may have been produced early in the first millennium. The other important type, the parabaik, appears to date from the 14th century. From at least the classical Bagan period (11th-13th centuries), specially processed leaves from the palmyra and talipot palms (borassus flabellifer and Corypha umpraculifer) were employed as material on which a scribe incised with a stylus horizontal lines from Buddhist texts, plus other treatises. Only rarely were diagrams or drawings inscribed. The leaves were rubbed with oil, earth and soot to preserve them and darken the script. Usually the title was inscribed on the cover while the donor or author's name and the date appear at the end. The leaves, once collated, were placed between two boards to secure them; bamboo rods or string were passed through two holes bored at the center. Size and decoration varied. Kammavaca are volumes consisting of one, five or nine extracts from the Theravadin Vinaya, each relating to specific ceremonies associated with monks. Noel F Singer writes that the earliest Kammavaca consisted of folios made of palm leaves, each of which had four lines of square-linked script; on a gold or silver background ("Kammavaca Texts: Their Covers and Binding Ribbons", Arts of Asia, 23, May-June 1993). In the 17th century, folios began to be made of pieces of cloth coated with lacquer and painted with cinnabar, and the square letters were written in thick, black lacquer. On rare occasions, folios were of ivory. Designs in gilt which had been reserved for the ends of folios, and pages and wooden cover boards now began to appear between the lines of the text. By the second half of the 19th century, the lines of script on the folio increased to six or seven and sheets of brass or copper were introduced as folios. Parabaik are manuscripts created from long strips of accordion-pleated paper processed from mulberry tree bark. Those for everyday use were darkened with a powdered charcoal mixture. Markings made by steatite crayons could be erased and the paper reused. Parabik, coated with a chalk mixture and polished, often bear beautifully illustrated Buddhist and other texts and have covers of glass-inset thayo. A library where Buddhist scriptural texts are kept is essential to every monastery. The texts are arranged in chests or cabinets called sadaik. The importance attached to these is expressed by the excellence of their craftsmanship. The body was constructed of wood, traditionally large single teak boards for strength and durability; it was often set on a high base to protect the texts from insects and damp, and was frequently covered with elaborate lacquer and inset glass decoration. Most sadaik are in the form of long, rectangular chests, dovetailed at the joints and with a lift-up lid. The one on right is placed on a footed two level base. It is decorated with lacquer relief moulding covered with gold leaf and inset with glass, suggesting gemstones. Two rectangular panels enclose figures within ellipsoids. Between the latter are stemmed lotus buds and blossoms formed of inset colored glass. The ellipsoids are echoed on the sides of the base. Another type rises vertically in three levels and is influenced by European Victorian furniture. The two lover sections are for manuscripts; the top has a recess with a glass door to hold a Buddha image. Since the early 1970s, kalagas, colorful sequined hangings with scenes from the life of the Buddha, Jatakas, and-to lesser extent secular themes, have been sought after by collectors worldwide. The term, meaning "Indian curtain" suggests an as yet undetermined Indian derivation. The art began in the mid 17th century and reached its zenith during the reign of King Mindon (1853-78) when the velvet which often forms the background was both imported and woven in the palace. The technique ("gold-thread stitching" in Burmese) involves applique, quilting and couching. Figures, foliage, architectural elements and so on were cut from the materials which include felt, flannel, cotton, silk, wool, lace and braid- and were attached to a background cloth of velvet or cotton, often with its own cotton backing. Sequins, imitation jewels and couched work in gold and silver tread created a rich appearance. Facial features were usually painted on. Most early kalagas are in long rectangular form with stories illustrated in narrow strips. Architectural elements and foliage serve as scene dividers, and space is defined by the relative positioning of figures or by colors, for example, darker in front and lighter at the rear. Today, in the revived industry in Mandalay, kalagas of varying sizes and themes are made and their technique is used in the production of a variety of other goods as well. It is not only in temple compounds and monasteries that one finds bell and gong in Myanmar. Many Burmese will also display these items-usually bought from a specialist vendor in the pagoda valley in their homes. They are considered items of devotion. The classic designs for Burmese bells and gongs date back many centuries to an era when clocks had yet to be introduced. In today's Buddhist monasteries, time is still measured by the sound of padded hammers striking bronze surfaces: calling the monks to chanting sessions or meditation; announcing alms rounds or meal times; starting classes in Dhamma (Buddhist philosophy). Certain gongs and bells are struck freely by visitors to shrines and pagodas as a form of prayer, homage or supplication. The round, flat gong of Shan origins produces sharp tones that are a favorite of nat worshippers; the large, ornate and more mellow-sounding temple bell is sounded three times by Buddhists paying tribute to the Buddha, the Dhamma and the Sangha (monastic community). Marionette theatre or yok-thei pwe enjoyed a pre-eminent place in Myanmar's performing arts tradition in the 18th and 19th centuries. The movements created by master puppeteers using the colorfully garbed and carefully assembled jointed wooden puppets in fact influenced the development of zat pwe, dance-drama later performed by live actors. Even today Burmese classical dance shows a pronounced similarity to marionette movements. 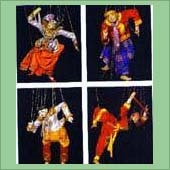 As in zat pwe, the primary subject matter for Burmese marionette theatre comes from the Jatakas, Favorite tales include those stories, which emphasize royal court intrigue and provide moral instruction via the performance's subtext. Standing up to a meter high, the marionettes may be manipulated by dozen or more strings. Some of the older, more elaborate figures, particularly those representing nat or spirit roles, display as many as 60 strings attached to every moveable part of the puppet, from elbows to eyebrows. A yok-thei performance displays not only the talents of the puppeteers, but of the singers, musicians, woodcarvers, embroiders and set designers as well. Due to the breakdown of royally sponsored classical arts during the British colonial era and the advent of motion pictures, yok-thei pwe declined by the 1930s. The puppets themselves, however, are still extremely popular.